Needle-thin spires of rock rise from the depths. Seamounts disappear under multi-colored overgrowths of sea fans and sponges. Reef sharks glide on the currents while schooling fish hold formation in the eddies. Under the shadow of a towering cliff, a field of volcanic sand and boulders hide cryptic bottom dwellers, and hot water bubbles up from hidden fumaroles. To say that Saba is unique among Caribbean dive destinations would be an understatement. And yet it is also a destination that is welcoming to all, with adventures that range from deep dives on current-washed pinnacles to easy explorations in calm shallows. The waters surrounding Saba are protected to a depth of 200 feet, and all dives are made from boats tethered to mooring buoys. To the west, a series of offshore pinnacles rise from deep water to within 90 feet of the surface, and often attract large fish and sharks. Smaller pinnacles are located closer to shore, and there are also a number of shallow to mid-range sites on the sheltered western side of the island, plus reefs and walls to the south. When weather permits, operators also visit sites along the island's windward side to the east, which are noted for healthy coral growth. All sites are within a relatively short boat ride of the harbor, as the island is just three miles across. Water temperatures range from 77 to 80 degrees in winter and can reach 85 in summer. The island's signature pinnacles are all deep dives, but can be explored while remaining within recreational diving limits. Nitrox is recommended to extend bottom times, and it's a good idea to stick with the divemasters at these sites, as they know how to work with the currents to minimize swimming effort and get the most from each profile. After taking in the pinnacles at Third Encounter, swim to the spire known as Eye of the Needle which rises from the blue with an impossibly thin profile. The currents that swirl around Diamond Rock nurture colorful corals and sponges, and attract bountiful marine life—including sharks. Hot Springs provides a glimpse of the island's volcanic origins; The sponge-encrusted steps of Tent Reef Wall rise to 30 feet to provide a long multi-level profile; The calm shallows of Torren's Point are ideal for hunting marine life among the boulders and small caverns. LIVEABOARD - 7-NIGHT ST. MAARTEN | SABA | ST. KITTS ITINERARY itinerary includes 5 1/2 days of diving, 2-3 days diving around St. Kitts and Nevis and 2-3 days within the Saba Marine Park. The schedule also provides for up to 3 island tours during the week allowing ample time for guests to explore forts, rainforests, duty-free shops and museums. See separate listing for departures from St. Kitts. *Port/hotel, immigration and Marine Park fees of $115 and fuel surcharge payable on board, airport transfers not included. LIVEABOARD - 7-NIGHT ST. KITTS | SABA | ST. MAARTEN ITINERARY includes 7 night accommodations, up to 5 dives daily, breakfast, lunch and dinner daily and beverages including alcohol. The schedule also provides for up to 3 island tours during the week allowing ample time for guests to explore forts, rainforests, duty-free shops and museums. See separate listing for departures from St. Maarten. *Port/hotel, immigration and Marine Park fees of $115 and fuel surcharge payable on board, airport transfers not included. 7-NIGHT DIVE PACKAGE including choice of garden or ocean view room, welcome cocktail, breakfast daily, hotel tax and service charges, use of internet, jacuzzi and pool. Click below for 7-night packages. Contact us for 5 and 6 night packages. This peaceful haven in an intimate and informal atmosphere allows guests to enjoy a range of comfortable accommodations, from spacious, well-kept rooms with ocean an dgarden views, fully-equipped apartments and luxurious Saban-style cottages. Onsite Tropics Cafe, with charming terrace dining and panoramic views, is the perfect place to relax any time of the day. LIVEABOARD - ST. MAARTEN TO ST KITTS The Caribbean Explorer II offers a unique itinerary with some of the best diving in the Northeastern Caribbean combined with exciting island tours. The area offers a blend of Dutch, British, French, and native cultures on some of the most scenic islands in the Caribbean on land and underwater. Weekly itineraries alternate between St. Kitts and St. Maarten with diving 5 1/2 days of diving the sites of St. Kitts, Nevis and Saba Marine Park. Click here for St. Maarten to St. Kitts itineraries. See separate listing for St. Kitts to St. Maarten itineraries. Save $600 per couple on select 2017 departures. ST. KITTS | SABA | ST. MAARTEN ITINERARY - The Caribbean Explorer II offers a unique itinerary with some of the best diving in the Northeastern Caribbean combined with exciting island tours. The area offers a blend of Dutch, British, French, and native cultures on some of the most scenic islands in the Caribbean on land and underwater. Weekly itineraries alternate between St. Kitts and St. Maarten with diving 5 1/2 days of diving the sites of St. Kitts, Nevis and Saba Marine Park. 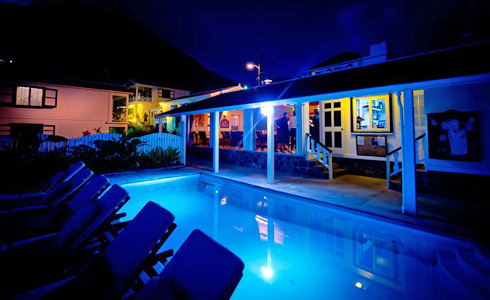 Click here for St. Kitts to St. Maarten itineraries. See separate listing for St. Maarten to St. Kitts itineraries. Save $600 per couple on select 2016 departures - from St. Kitts on 5/7/16, 11/19/16 and 12/3/16 or from St. Maarten on 5/28/16, 7/30/16, 10/1/16 and 12/10/16. Though physically small, Saba offers a wide range of diving experiences, from dramatic seamounts and walls to shallow spur-and-groove reefs and volcanic-forged rock gardens. All waters around the island lie within a marine park. A combination of strong conservation efforts, limited diver traffic and a steady flow of nutrient-rich waters result in some of the healthiest and most prolific growths of corals and sponges in the Eastern Caribbean. There are no beaches on Saba, and the steep cliffs that surround most of the island preclude shore diving. All dives are by boat, originating at the Fort Bay on the island's south coast. 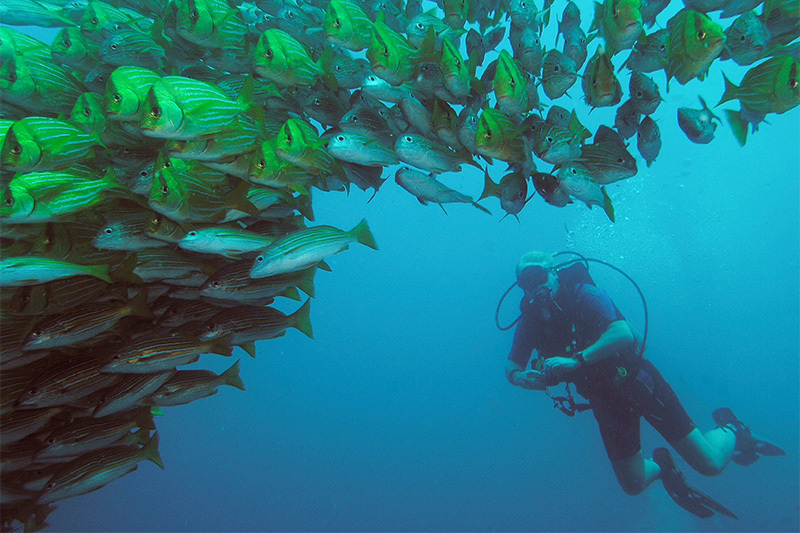 From there, all dive sites are within a half to three miles of the harbor. Mooring buoys are maintained at all dive sites, which offer a broad range of underwater topographies. A mile to the west of the island, a group of seamounts rise from deep water to within 85 or 90 feet of the surfaces. Formed by volcanic activity, these structures sit below the effects of storm surges, and are covered in dense growths of sea fans and sponges. Close inspections will reveal a wide range of small marine life living on the vertical faces on the pinnacles, while the bigger picture takes in groupers, schooling jacks, turtles and sharks. Gray reef and nurse sharks are the most common sightings, but divers may also encounter hammerheads, black tips and on rare occasions even a whale shark or manta ray. The five pinnacle sites have evocative names such as Third Encounter, Twilight Zone, Outer Limits, Mt. Michel and Shark Shoals, and even more dramatic is the lone pinnacle known as Eye of the Needle, which rises in a thin column or rock less than ten feet in diameter. Closer to Saba's western shore, the sea mounts of Man O’ War Shoals begin at depths of 80 feet, and rise close to the surface, or in the case of Diamond Rock, rise above the waves to create a cliff side sanctuary for sea birds. These sites are often washed by currents that encourage abundant and colorful growth but are not as likely to attract the pelagics found on offshore pinnacles. They do hold abundant populations of reef fish such as blue tangs, big eyes and juvenile barracuda, along with a wide range of invertebrates that hide among the sea fans and sponges. The dark volcanic sands at the base of these structures are populated by flying gurnards, batfish, sand tilefish and jawfish. Saba's most sheltered dive sites are found close to the western shore, from Torrens Point to Ladder Bay. This area includes a number of interesting landscapes that range from spur-and-groove formations to networks of caves and tunnels formed by ancient lava flows, boulder fields and patches of hot sand that hint at the island's dormant but still present volcanic nature. Shallow to mid-range depths provide ample time to seek out a menagerie of Caribbean reef life among gardens of star coral, brain coral and gorgonian. A close look at a sea fan may reveal a cryptic sea horse lurking among the branches. To the south, an extended rock ledge known as Tent Reef begins at a depth of only 12 feet, and stair steps down in a series of deep undercuts to a wall and a series of steep coral outcroppings separated by deep sand channels. Island divemasters often refer to this area as Saba's aquarium, because it is home to the island's widest variety of reef species, and it is a favorite location for night dives. A number of additional dives sites located on the island's eastern side are dive on an intermittent basis when prevailing trade winds and swells subside. These sites are coral reefs in a more traditional sense, with coral heads rising from white sand bottoms. Elkhorn, brain and mushroom-shaped star corals dominate at sites such as Greer Gut, Big Rock Market and Hole in the Corner, where currents are mild to non-existent and visibility can be exceptional. Entry/Exit Requirements: A valid passport is required that must be valid at least 3 months beyond the date of entry into the country. Saba also requires an onward or return airline ticket and proof of lodging or hotel confirmation. No visa is required for stays less than 90 days. There is a departure tax of $10 per person upon departure. No vaccines are required to enter Saba. Check with your doctor and the Centers for Disease Control on recommended vaccinations for travel at cdc.gov. Saba is not your typical Caribbean island. There are no sandy beaches, no palm trees rustling in the trades. With no natural harbor and shores ringed by steep cliffs, this volcanic spire once provided a natural fortress for smugglers and pirates in the age of sail. Generations of island men took to the sea, leaving wives and sweethearts ashore to earn Saba the nickname “The Island of Women.” Those women put their time to good use, creating intricate hand-made lace needleworks that are prized by collectors. Today, the island has earned another feminine nickname: “The Unspoiled Queen.” Both land and sea are incorporated into nature preserves that attract divers and eco-tourists to one of the most pristine ecosystems in the Caribbean. There are no large resorts in Saba, just a single cliff-hugging road and three small villages perched on green volcanic slopes. Until the latter part of the 20th century, the only land access to the island was through a long set of stairs carved into the cliff face at Ladder Bay. Today, a small harbor accommodates ferries from St. Martin and Statia, and aircraft land on the world's shortest commercial runway. Island landscapes are dominated by the towering peak of Mount Scenery, which rises to a height of nearly 3,000 feet, and is often shrouded in clouds. A 90-minute climb up a mountainside trail set with more than 1,000 stairs leads to the summit, where a cloud forest known as the Elfin Forest Reserve provides a landscape like nothing else in the Caribbean. Saba uses 110-volt AC (60 cycles), so most U.S. made appliances don't need adapters. The country code is 599. Check with your provider to see what International plans are available or you will be subject to roaming charges. Many hotels offer WiFi. Some facilities offer purified water from the desalination plant. Bottled water is readily available for purchase. The official language on Saba is Dutch, but English is widely spoken. Saba uses the U.S. Dollar as their official currency. ATMs are available and credit cards are accepted at most places. Saba is on Atlantic Standard Time (AST) and does not observe Daylight Savings Time. Saba is 4 hours behind Greenwich Mean Time (-4 GMT). Saba is a Caribbean Island, located southwest of St. Maarten and a few miles north of St. Kitts. Tiny Saba is often called The Rock because it barely covers 5 square miles. Dubbed the 'Unspoiled Queen', Saba (pronounced SAY-ba) is both one of the smallest and tallest (rising up to nearly 3,000 feet). 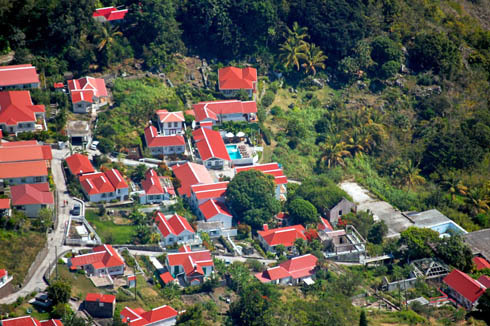 Saba is known for its stunning hiking trails, pristine diving, day spas and awesome eco-lodges. Saba's spectacular coral formations, lava tunnels and structural diversity stem from its volcanic origins. The permanent population of Saba is between 1,500 - 1,600, increasing by 200-300 when the Saba University of the School of Medicine is in session.